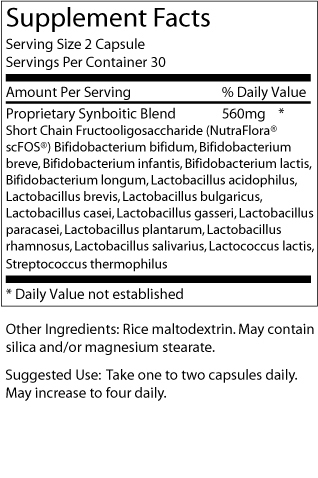 Where can I buy probiotics or Order Probiotics? What is the best probiotics available in the market today? How do I know if the probiotic products are suitable for me? Is probiotics supplements for everybody? How do I avoid traffic jams and stop paying parking charges? .... and I like to get delivery of my order to my doorstep .... using online purchases, of course! At Cell Nutritionals, USA ... where you order according to your need, no sales personnel hassle, buy in confidence, at great purchase value and in the private convenience of your home. 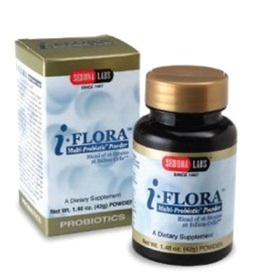 When you buy probiotics from Cell Nutritionals, USA, you are buying in confidence. Probiotics are friendly bacteria our bodies rely on for metabolizing foods, absorbing nutrients, and keeping unwanted bacteria at bay. Acidophilus and bifidobacteria in particular promote a balanced intestinal tract by producing organic compounds – such as lactic acid, hydrogen peroxide, and acetic acid – that increase the acidity of the intestine and inhibit the reproduction of many unwanted invaders. The numbers of friendly bacteria decline as we age, but the use of antibiotics, cortisone, and birth control pills; radiation and chemotherapy treatments; environmental pollutants, food additives, alcohol, tobacco smoke, stress and poor dietary habits can all negatively impact the delicate balance of friendly bacteria. "Friendly bacteria" are especially necessary to maintain immune and gastrointestinal health especially when the immune system is under attack. When harmful microbes dominate the intestinal environment, they can cause a series of conditions that can compromise health. When friendly bacteria dominate the intestinal environment, the odds are that your body won't even know that it has ever been under siege by the bad guys! Bifidobacteria were discovered in 1899 by Dr. Tissier of the Pasteur Institute, France, from the feces of healthy, breast-fed infants. Bifidobacteria are concentrated in the lower small intestine and large intestine, and act as guards, keeping the small intestines --where most digestion and nutrient absorption takes place--and free from harmful invaders. As for the liver, it carries out many chemical functions in the body, including decomposing and detoxifying poisonous substances absorbed from the intestine. Secretions of harmful microbes can strain the liver, but a healthy population of Bifidobacteria attacks bad guys and keeps their unwanted toxins at bay. B. breve - beneficial for healthy bowel function and may help maintain healthy digestive tract by stimulating an immune response. B. bifidum – helps maintain healthy mucosal on the intestinal walls and is reported to have immune supporting properties. B. infantis – less “robust” than other bacteria, but a decline in these bacteria is always accompanied by a rise in dangerous bacteria such as E. coli or Salmonella. 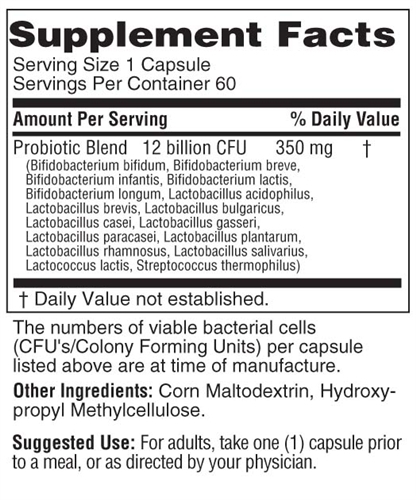 B. lactis - resists acid digestion and may have help immune supporting capabilities. B. longum – eliminates nitrates and studies show that may be able to influence an immune response. Lactobacillus is the body’s first line of defense against invading species and opportunists that can take over a weakened immune system. Because lactobacilli can live in an environment regardless of oxygen, they have the ability to use up all the oxygen in their environment leaving their harmful competitors, who require oxygen, unable to survive. Research also supports the role of Lactobacilli in supporting healthy cholesterol levels for heart health. Studies in animals and humans have shown that ingestion of Lactobacillus acidophilus helped maintain healhty blood cholesterol levels. L. acidophilus – a superb solider against foreign invaders found in yogurt. L. bulgaricus – a transient bacterium, commonly found in yogurt. It promotes healthy digestion. It also produces a combination of acid and hydrogen peroxide to defend against bad guys. L. casei – a transient bacterium that helps to maintain a healthy mucosal barrier, which assists in preventing the colonization of intrusive, unwanted strains. L. gasseri – easily can survive passage through the gastrointestinal tract by adhering to the intestinal tissues. Helps maintain healthy cells and cholesterol levels. L. paracasei – attenuates muscle contraction of the bowel promoting regularity. L. plantarum – supports restoration of normal post-antibiotic flora in the intestine. L. rhamnosus – helps to maintain healthy mucosal barrier on the intestinal wall, therefore promoting regularity and healthy bowel function. L. salivarius – studies show that this strain has the ability to create an environment not suited for strains that cause digestive upsets. It makes sense. Ladybugs seem to make everyone happy. Beetles and locusts put everyone in a bad mood. It has long been thought to be the same with the good and bad bacteria in the gut. Recently studies correlating good bacteria with good moods have gotten the attention of mainstream doctors. Streptococcus and Lactococcus Strains Too! 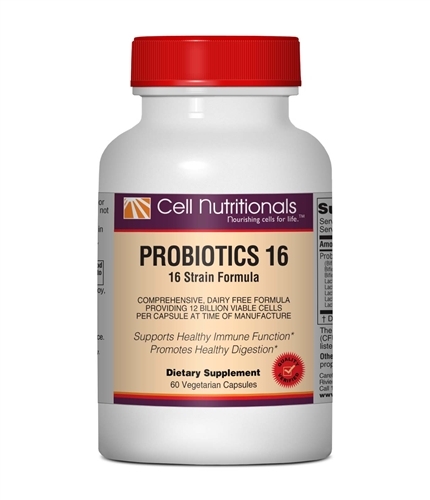 To round out our Probiotics 16 formula, we included two additional strains. One is Streptococcus thermophilus. Streptococcus is a normal inhabitant of the human body.S. thermophilus acts as antioxidant scavenging for free radicals and also stimulates an immune response. It also helps to maintain a healthy mucosal barrier to help prevent the colonization of intrusive strains. 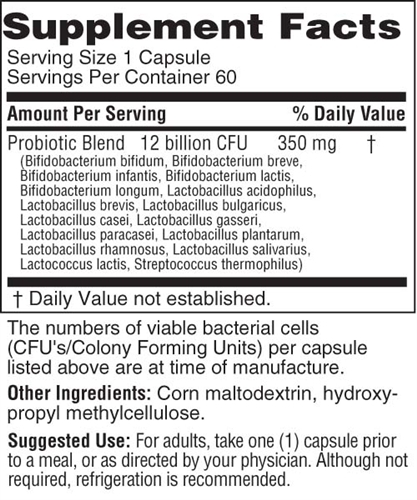 The second is Lactococcus lactis, commonly responsible for the souring of milk, and it appears to inhibit the growth of harmful strains. Friendly bacteria in probiotics deliver dramatic improvements in nutritional uptake as well as improved elimination. Another reason to keep friendly bacteria levels high is that they produce lactic acid, which has been shown to improve utilization and absorption of calcium -- so critical to maintaining healthy bone mass! Traditionally probiotic products have required refrigeration for any chance of cell survival, but new technology allows for probiotics to maintain high cell counts (greater the 50%) even after 12 months of shelf life (stored in a cool, dry place). So, this kat's recommendation: Either buy just what you need for the next few months or else refrigerate when you receive to ensure maximum product effectiveness. The use of antibiotics while taking probiotics may decrease effectiveness of probiotics by killing a significant number of the live "friendly" organisms. Administration of antibiotics and probiotics should be separated by at least two hours. Patients who are severely immuno-compromised maybe at risk for bacterial or other pathogenic infections and should consult their physician about taking probiotics. When beginning a probiotic regimen to combat constipation, it is important to realize that, depending on the level of toxicity, the die-off of toxins may result in side effects, specifically gas, bloating, and possible headaches. It may be best to build up your body's comfort with probiotics gradually. About 2.5 - 3 pounds of human body weight is from intestinal microbes, which include about 100 species and as many as 100 Trillion cells!! Under ideal conditions, with no competing microorganisms, bacteria can divide once every 20 minutes. That means after 48 hours, one lonesome bacterium can produce over 42.5 million new bacteria! Beneficial bacteria are never attacked by the body. The body realizes that these "friendly" bacteria are essential to health and leaves them alone! Buy Probiotics in full confidence at Cell Nutritionals, USA!